St. Peter Cemetery is owned by the Archdiocese of St. Louis. 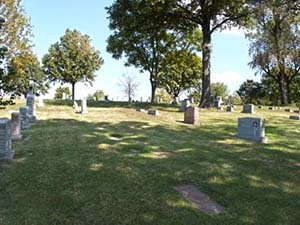 St. Peter Cemetery in Kirkwood is the oldest Catholic cemetery in St. Louis county. In 1832, Father Charles Van Quickenborne, the head of the Jesuit St. Stanislaus Novitiate in Florissant, began missionary work in this area. In 1833, Catholic families here purchased eighty acres on Monroe Ave & Geyer Road for a church and cemetery. The first-recorded burial was that of Unity Breen, wife of Peter Breen, who died in January 28, 1835, at the age of 28. In 1867, a new brick St. Peter's church was built closer to Kirkwood Road, however the cemetery remained at its original location on Monroe Ave. The older church burned to the ground in 1875. The cemetery is still active today. It was recently expanded with the opening of two new burial sections, both include the choice of monument lots or lawn level marker lots. There are also prominent lots for the burial of priests and also one nearby for the burial of Ursuline nuns. Records below were acquired from the Archdiocese of St. Louis on on January 1, 2018.